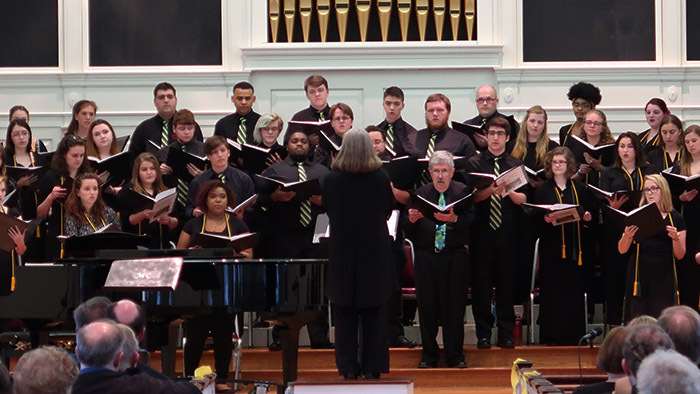 The McDaniel College Choir’s thirty-nine members processed through the aisles of Baker Memorial Chapel at the beginning of the night on Sunday, April 23, making their way to the open stage, golden organ pipes on a red façade their backdrop. Once gathered at the front of the chapel, the choir began with Ysaye Bardwell’s “Wanting Memories,” an upbeat piece that began with only a few voices, then progressed with the addition of each section of the choir. The singers were accompanied by a simple, subtle bass line. After this introduction, it was the audience’s turn. Boudreaux, from the stage, sang out the lyrics to a Michael Praetorius piece, and the audience sang back. Soon the audience and the choir were singing together in a round, dozens of voices flowing and filling the chapel. With the spotlight back on the choir, the singers segued into four pieces about the expression of love. Three out of four were in foreign languages. One, “A Red Red Rose,” was directed by senior Sakena Martin, who conducted the uplifting, emotional piece with natural ease. The next pieces constituted another theme. Each evoked a certain place and the “things that happened there.” Eliza Gilkyson’s bittersweet “Requiem” was inspired by the 2004 Asian tsunami; the singers called on Mary to save them from their “sea of tears.” The choir sang another piece, brand-new, giving it its world premiere at the concert: “Spirit of the Winding Water” by Robert S. Cohen, who drew from Native American culture, featuring Navajo-style percussion and vocals—even including phrases from the Navajo language. Several of the night’s pieces spotlighted soloists, including “Te Quiero,” which showcased four singers’ clear voices and dynamic phrasing over the rest of the choir’s quiet humming. Another, “I’ll Imagine You a Song,” was sung in memorial to members of the McDaniel community who have recently passed. A majority of the pieces also featured instrumental accompaniment from the piano, played by Dr. David Kreider, or percussion and flute. Later in the night, the McDaniel College Madrigal Singers, a smaller group of Renaissance-style performers, stepped forward from the choir to sing two works. The group swayed to the playful “Now is the Month of Maying,” and sang the sweet and romantic “A Nightengale Sang in Berkeley Square,” emanating an authentic 1940s style. The end of the evening served as a tribute to the departing seniors. McDaniel’s choir sang Daniel Hughes’ melancholy “So We’ll Go No More A-Roving” for their members of the Class of 2017, who have little time left to “go roving” on the pathways of McDaniel. Shortly after, the choir performed their annual closing piece, “The Lord Bless You and Keep You.” The choir once again surrounded the audience in the aisles, and alumni singers joined in. The audience gave a standing ovation—it certainly was a performance to remember.